The University of Washington Department of Rehabilitation Medicine offers a Master of Prosthetics and Orthotics degree. This setting enables students to experience foundational courses led by expert faculty from diverse disciplines whose shared goal is facilitating development of highly competent clinicians. The signature features of the University of Washington’s MPO Program are the accomplished faculty; multidisciplinary courses taken with PT and OT students; intimate learning environment (instructor/student ratio 1:12); and clinical skill development through experiential learning. The University of Washington Prosthetics & Orthotics Program is accredited by the Commission on Accreditation of Allied Health Education Programs (CAAHEP) upon the recommendation of the National Commission on Orthotic and Prosthetic Education (NCOPE). As an accredited program, the University of Washington curriculum adheres to this national professional organization's standards and guidelines. CAAHEP is located at 25400 US Highway 19N, Suite 158, Clearwater, FL 33763. The program begins in the fall quarter of the academic year, and is seven consecutive quarters in length (including a summer quarter between year one and year two). Attendance is full-time during the day, Monday through Friday. Students complete 114 required credits over the course of the program and take from 15 to 18 credits per quarter. The degree program consists of foundational courses, research courses, and core prosthetic and orthotic courses. Foundational courses (taken with the occupational and physical therapy students) during the first three quarters of the program provide the theoretical groundwork for the professional competencies and encourage an interdisciplinary perspective. Core prosthetics and orthotics courses instruct students in the principles of designing and fabricating prostheses and orthoses, developing patient evaluation skills and creating individualized treatment plans. Patient volunteers participate throughout the span of the program allowing students to gain practical experience in all aspects of the clinician-patient experience. Core courses related to research methods and evidence-based practice provide the student with the knowledge and skills to critically evaluate research, to use research evidence to inform clinical practice, and to integrate outcome measures to evaluate clinical practice interventions. Clinical rotations begin the fourth (summer) quarter of the program. Students attend a local clinic once a week for the full quarter, and then continue to rotate one day a week at a different clinic each subsequent quarter. During the break between summer and fall quarters, students complete a concentrated, two-week rotation at a site outside of the region. 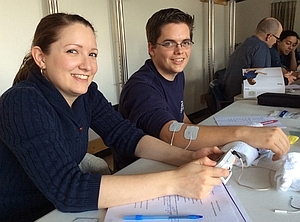 Upon successful completion of the program, the University of Washington School of Medicine awards students a Master of Prosthetics and Orthotics degree. Following graduation, the student must complete a one-year residency in each discipline at a National Commission on Orthotics and Prosthetics Education (NCOPE) approved site. This residency requirement must be completed for eligibility to apply for the National Certification Boards administered by the American Board for Certification in Orthotics, Prosthetics & Pedorthics (ABC). Exemplify the role of the prosthetist-orthotist by providing ethical and responsible patient-centered care. Demonstrate awareness of the humanity and dignity of all patients and individuals within a diverse and multicultural society. Serve as knowledgeable, competent, and capable members of multidisciplinary rehabilitation teams. Effectively and appropriately communicate with patients, peers, and other clinical service providers. Understand, critically evaluate, and appropriately integrate scientific evidence into clinical practice. Integrate knowledge of human function and prosthetic-orthotic concepts in the assessment of patients and the formulation, implementation, and follow-up of a comprehensive treatment plan. For a complete list of courses, please see the MPO course schedule.